Our sales consultant, Becky Hazell, communicated with Weald Community Primary School to discuss plans to inject fun and adventure into their dated outdoor play area. After the initial briefing, we removed the long-standing play equipment and surfacing and prepared the ground for installation. We are pleased to have created a large and inclusive playground with activities suitable for all, presenting various challenges to keep everyone at all abilities and ages engaged and happy. We created the playground equipment to provide open visibility and to make supervision of the school children easier. The installed equipment is not only exciting and stimulating for the children, but it also helps to build upper body strength, core stability and co-ordination. Furthermore, it supports imaginative role-play to promote social games and interaction amongst peers. We created a bespoke ‘Weald’ Climbing Castle made from robust, high-pressure treated, ‘play grade’ timber. This amazing structure offers an exhilarating zone for active play, creativity, learning and discovery. View a selection of our Modular Climbing Towers here. We wanted to create lots of physical opportunities to advance the gross motor skills and build upper body strength for the school children at Weald Community Primary School, whilst considering all ages and abilities. 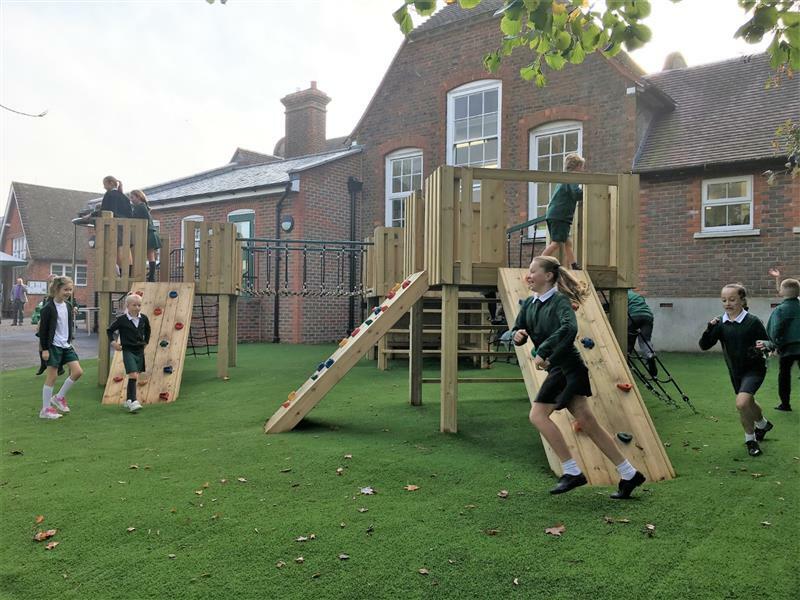 To ensure children reap the benefits of the new playground all-year-round, we used deluxe artificial grass for the surfacing with a shock-absorbent sublayer to minimise the impact and risk of injuries. To help build climbing confidence in the children, we included a 1.2-metre-high deck, which can be accessed by a ladder, climbing ramp, climbing ramp with rope and scramble net. The bespoke, modular, play tower concentrates on developing upper body strength. The reduced height supports children to choose the level of challenge they feel most comfortable with. As their self-confidence progresses, the children can alter their play to incorporate more challenges. For instance, moving off the deck onto the joining net traverse, which takes them onto the higher tower decks or ascending onto the more challenging access points on top of the higher deck. To create versatility, we included two deck heights with varying access points. The easiest option being the great 1.5 metre ramp that leads to the lookout tower and fireman's pole. The following challenge is the vertical ladder. Lastly, the large vertical climbing wall motivates children to practise their climbing skills and stability. The Suspension Bridge supports imaginative role-play as children run and play between the decks. They can get creative by playing tag, or police and robbers, for example. 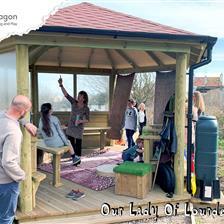 The Small Seated Den Space under the central deck supports additional imaginative play alongside offering a communal space in which children can feel like they are playing inside a secret den (although still fully visible to the supervising adults). We also installed three different height, galvanised and powder-coated pull up bars in bottle green. This incredibly popular piece of apparatus allows children to work on their upper body strength and coordination, whilst turning around, swinging upside down and having a blast! 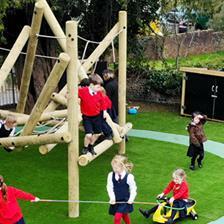 The children and teachers at Weald Community Primary school are thrilled with their new active playground. 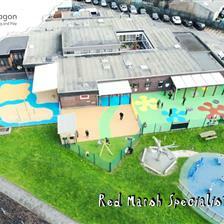 They now have a suitable, stimulating outdoor play area which can be utilised all-year-round! View our exciting range of Trim Trail Equipment here. We interviewed a few children about what they liked best about the new castle and we were delighted with the results. Dexter was talking about how they often play "tag" and love using the den space underneath as a “home” as well as the different levels. Jessica and Katy told us about how they have created an imaginative game that they love to play with their buddies called “dinosaurs” and use the den as a cave. The best outdoor playgrounds inspire children’s creativity, encourage imagination and endorse active play. It should be a zone for learning important life skills whilst having fun. At Pentagon Play, we have years of expertise in this field and can help to create a stimulating adventure playground for your school, to support children’s development. Please Contact Us for further information and free expert advice.